True Lies is a 1994 American action comedy film written, directed and co-produced by James Cameron. It stars Arnold Schwarzenegger, Jamie Lee Curtis, Tom Arnold, Art Malik, Tia Carrere, Bill Paxton, Eliza Dushku, Grant Heslov and Charlton Heston. It is a remake of the 1991 French comedy film La Totale! The film follows U.S. government agent Harry Tasker (Schwarzenegger), who balances his life as a spy with his familial duties. 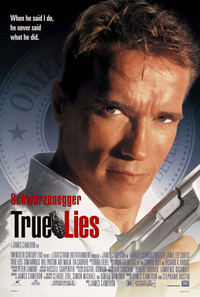 True Lies was the first Lightstorm Entertainment project to be distributed under Cameron's multimillion-dollar production deal with 20th Century Fox, as well as the first major production for the visual effects company Digital Domain, which was co-founded by Cameron. This webpage uses material from the Wikipedia article "True_Lies" and is licensed under the GNU Free Documentation License. Reality TV World is not responsible for any errors or omissions the Wikipedia article may contain.